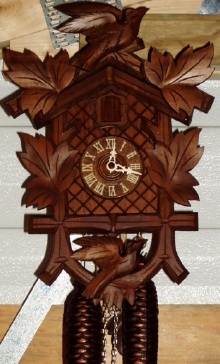 We have a German black forest cuckoo clock. It keeps time, however when it cuckoos it is very slow and you can here the gears running when this happens. How can we fix this without spending a lot of cash. A clock that chimes, or cuckoos too slow could be due to not having been oiled for a long time. The old oil dries up into a solid lump and can slow or even stop it from striking. Cuckoo clocks are not as easy to service as most other mechanical clocks because of the complexity of its movement and the fact that it is more difficult to take out the movement. I don't know what your local clock shop would charge for this. They vary greatly from place to place. Some shops I know do not even work on cuckoo clocks at all. My shop charges $50 to $70 to clean and oil cuckoos. That will at least give you an idea of what to expect. You also stated that the clock made a noise when striking. This could mean the movement is worn from running dry. If this is the case, it may cost more than the clock is worth to repair. Some shops will install a new movement for you for less than the cost of repairing the original one.